April 2015 – A drone lands in Washington D.C. after violating restricted airspace. December 2013 – Amazon founder Jeff Bezos created a buzz throughout the tech world when he introduced the idea of using drones to deliver goods to online shoppers. You may have heard of drones recently in the news whether it is in regards to business, the military or from drone enthusiasts. Drones have been used by the military for decades. Predator drones, for example, have been used for surveillance and as unmanned weapons in the battle fields thus keeping our military safe for harm. Now drones are being considered for commercial use. Despite a current FAA ( Federal Aviation Authority) ban on drones for commercial use, drones will have an impact of the business world in the near future. Let’s look at some of the ways that drones are currently being used and how they may be used in the future. Drones are currently being used in agriculture by farmers looks over fields for potential irrigation and crop problems. They have even been used to keep track of cattle. Police use drones currently to track down criminals and even for search and rescue missions. They are a cost-effective alternative to manned helicopters. Just last month drones were used in Nepal to search for victims in the massive earthquake that hit that region. Drones were able to get into areas that were not accessible by helicopters or search and rescue vehicles. Real estate agents use drones to show off high-end homes with wide expanses of property that would not be easy to show during a walking or driving tour. Photographers use drones to capture unique photographs that would be hard to get by walking. Where is the impact of drones likely to be felt next in the business world? Archaeology – Believe it or not, thermal images enable the researchers and scientists to see beneath the first layer of earth’s crust, which can help them locate buried structures. Humanitarian Work – Researchers at the Harvard-MIT Division of Health Sciences and Technology are developing drones that can deliver vaccines and other critical medical supplies to remote locations in the developing world. Expanding Internet Access – Mark Zuckerberg, the Chief Executive of Facebook, has purchased Ascenta, a solar-powered drone company based in the United Kingdom, to extend the reach of Internet connectivity across the entire planet. Food Delivery – A Silicon Valley start-up announced plans to use drones to deliver tacos to its customers, until the FAA imposed its sanctions pending drone regulations. Commercial Delivery Services – If regulations from the government allow commercial delivery services, the United States could see the delivery of commercial products via drones. This could include mail, grocery, packages, or medical items. Business Activity Monitoring – Drones could easily monitor what is going on aerially in several fields of work such as: construction, topology surveys, shipping services, geological surveys, and thermo imaging. Sporting enthusiasts could watch their favorite team from the sky, marketing teams can advertise from the air, and even college students could check out books from the campus library using drones. The options are endless for the use of drones in business. Remember the “good ole days” when businesses used a Rolodex, paper files and index cards? It really wasn’t all that long ago that those methods were used to store customer information and organize contacts. Now we have CRMs or Customer Relationship Management. What is this and what are the more popular CRM systems? Customer relationship management (CRM) is a term that refers to practices, strategies and technologies that a company uses to manage and analyze customer interactions and data throughout the customer’s life cycle. The goal is to improve business relationships with customers. A CRM system gathers information about the customer from different departments within the company and from across different channels such as social media. A typical CRM would include information such as: email, company website, phone, live chat, direct mail, social media and any other marketing materials your company uses. Also included would be the customers buying preference, purchase history and any specific concerns. All this information in one place means it is easier to manage and help customers quickly and professionally during sales visits, phone calls or meetings. CRM software consolidates customer information and documents into a single CRM database so business users can more easily access and manage it. Some of the most popular CRMs include: Salesforce, InfusionSoft CRM Software, Snapforce CRM Software, and Sage CRM. Click on each link to see a demo, find prices and ask questions about each type of software. Choose depending upon the size of your company, marketing and sales needs and interaction types common in your company. To view the Top Ten CRM Software Packages follow this link to Software Advice online. The biggest benefit most businesses realize when moving to a CRM system comes directly from having all your business data stored and accessed from a single location. Before CRM systems, customer data was spread out through different departments and stored in various computer files. With CRM, files, contacts and interactions are all stored in the same place thus stopping redundancies and confusion in the workplace. Not too long ago, if a customer had a problem with a company, product or service, they only had a couple of options- call or write the owner/manager to discuss the problem. In today’s technologically advanced world where a customer can easily pick up their smartphone and instantaneously access an online review site(for thousands if not millions to see), it is no wonder that managing online reviews has become a critical part of businesses online behavior. According to Local Results Online, 60% of consumers consider ratings and reviews when researching a product or service. So how should your company handle online reviews as well as manage and avoid negative reviews? Monitor Social Media and Online Review Sites – Someone from your company should be monitoring online sites from Facebook, Twitter and other social media for your company’s name and brand. Google Alerts can help with this. Monitor Online Review Sites as well including Yelp, Google Review and Angie’s List. Most review sites (even those for specialized niche markets) offer monitoring and alerts when your company’s name has been mentioned. Respond – Whether comments or posts are positive or negative in nature respond quickly and professionally. This shows that you are hearing what your customers are saying. It also shows that you are “on top of your game” to the customers who access these review sites. When you encounter a customer who is genuinely upset or feels wronged, reach out to them online and, if you can, personally to make amends for whatever happened. In the long run it will cost less to keep that old customer happy than convert a new one. If a post or review is stating false information and facts, you should also respond. This should be done calmly, and in a professional manner. Your grace under fire will be noticed. Promote Positive Feedback – Create a “rate my experience” section to your landing page. While you are at it, encourage people who post positive comments on social media to also review your business on the Online Review Sites. Managing your company’s online reputation can take a little time each day but it is a critical step to fostering good relations with your customers. No one likes negative feedback. Fortunately, that feedback can help you fix weak points and make your brand even stronger if you handle the reviews correctly. Far From the Tree Wins Business Plan Competition! Far From The Tree, LLC produces hard (alcoholic) cider in Salem, MA, committed to using natural, locally sourced ingredients in all their products, while adhering to traditional cider making methods that go back hundreds of years. Congratulations also go to second place winner Insomnisolv, a company that is developing a proprietary wearable device which helps insomnia without taking drugs and instead uses rhythmic stimulation. Insomnisolv was awarded $5000. 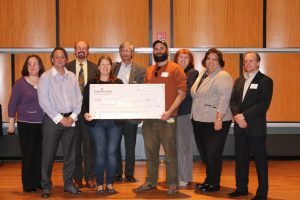 Third place and $3000 was given to Bonaloop, a business that connects residents with local students to complete odd jobs using web and app technology. Ask any business owner, regardless if their company is large or small, new or well-established, what they would like most for their company and a majority will answer “more customers.” In this data driven world we live in that means driving more customers to your website to find out about your product or services. What are some of the best strategies to increase traffic to your website and thus generate more sales? We went in search of creative and actionable ways that your company can drive more traffic to your website. Research done by Forbes, Entrepreneur and Google show some methods/suggestions that may help your marketing department seek out your targeted audience and get them to your site. Advertising – It may seem like an obvious answer, but paid searches, display advertising and social media advertising are excellent ways to attract visitors to your site and build brand awareness. Check out Google AdWords for Pay-Per-Click advertising, where your company can: set an advertising budget, target ads to customers in certain countries, regions or cities – or within a set distance from your business or store and reach the right people at the right time. Get Social – Start a Facebook, Instagram, Twitter or other social media link to your homepage. Use social media channels to promote your content. If you have a niche specific product, you may be able to capture your audience on social media then link them back to your main page. The more places your brand appears, the more customers will begin to recognize your business. Focus on Long-Tailed Keywords – Single keywords are quickly becoming a thing of the past. Make sure your posts include all the relevant terms and phrases related to your topic. For help finding and writing these long-tailed keywords read more at Long-Tailed Keywords, as suggested by Forbes. Headlines – Headlines are one of the most important parts of your content. Your headlines are what will get people in the door, particularly when you share your blog posts via social media. For great ideas on writing irresistible headlines read more. Link Building – Finding and registering your company with free directories (called Link Building) is one of the many methods used in Search Engine Optimization (SEO). The stronger and more valid your links, the more the search engines will recognize your site. Ask parallel or partner companies to link to your website to build even stronger links. Quality Content – We have all heard that Content is King so produce quality and dynamic content regularly to get your company noticed by the search engines. Search engines are rewarding people and companies who are getting high-quality, consistent content coming from them. Update blogs, videos and images regularly to maximize the value of your content. Interact- Connect with customers via posts or online reviews. Answer and comment to all who comment or critique your business. Remember there are people waiting to see how you handle yourself even in the face of a bad online review. One of the essential features of a successful business is a trusting and professional relationship between employer and employees. One of the best ways to ensure that this relationship is properly established from the very beginning is the use of an employee handbook. While it is definitely not the most interesting document to read(or write for that matter), it is a document that is necessary to establish a uniform, well-defined personnel policy. It is a convenient method to clearly communicate employer standards, legal obligations of the employer, legal rights of the employee and many times can reduce the risk of employee lawsuits. Using tips from Human Resources online, the Employment Law Network and the U.S. Small Business Administration, we have crafted a list of items you will want to consider including in your employee handbook. Company Goals and Mission – While reading a lengthy document about company rules and regulations may not sound thrilling, a short mission statement will help introduce your company to the employee officially. This list of goals will give the employee a better sense of what should motivate them and where he/she fits in the larger purpose of the company. Anti-Discriminatory Policies – Employers must comply with the equal employment opportunity laws prohibiting discrimination and harassment, including the Americans with Disabilities Act. Handbooks are a perfect place to spell out these laws and how employees are expected to comply with them. Read More about Discrimination and Harassment Policies. General Policies and Procedure – This is a great place to go over the basics such as: dress code, pay periods, time sheets, company holidays, defined work hours/week and other incidentals. This may also include computer use and telephone usage. Employment Policies– This section of the handbook should include items such as: employment eligibility, job classifications, employee referrals, employee records, job postings, probationary periods, termination and resignation procedures. Read more about Labor Laws. Employee Benefits – Detail any benefit programs for employees and eligibility requirement including: health insurance, retirement plans, wellness plans and other optional benefits. Be sure to include a list of legal benefits. Here is a list from the US Small Business Administration of required Legal Benefits. Safety and Security – We all want employees to be safe at work so include your policy for creating a safe environment for employees. Include compliance with the Occupational Safety and Health Administration’s laws (OSHA) that require employees to report all accidents, injuries, potential safety hazards, safety suggestions and health and safety related issues to management. Leave Policies – Your company’s leave policies should be carefully documented, especially those you are required to provide by law. Family medical leave, maternity leave, jury duty, military leave, and time off for court cases and voting should all be documented to comply with state and local laws. This is also a good section to include vacation policies. Problem-Resolution Procedure – Even with all of these rules and regulations spelled out completely in writing, there will always be questions and issues raised throughout the year. Create a procedure, whether is is within Human Resources (or with someone in a leadership position if your company does not have HR) of how you will deal with such issues.